The Centre for Peace, Security and Developmental Studies (CPSD) hosted a National Seminar titled “The Silver Lining: Beyond Prevalent Perceptions”. The proceedings included two sessions and were chaired by President AJK Sardar Masood Khan and Lt Gen Agha Muhammad Umer Farooq (Retd) respectively. Participants at the event included members of the academia, experts and policy practitioners as well as members of the civil society, businessmen, lawyer’s community and media. In his opening remarks Chairman CPSD Abdullah Dadabhoy welcomed the panelists and participants of the national seminar. He elaborated on the aims and objectives of CPSD and also explained the concept of the seminar. Chairman CPSD Abdullah Dadabhoy stated that CPSD will continue such seminars in order to highlight the way forward for the whole nation. The Chief Guest of the proceedings President AJK Sardar Masood Khan started on the subject of “Evolving World Order and Emerging Opportunities & Challenges for Pakistan” stated that there was a significant shift in global affairs in both the realms of power politics & economics. Pakistan needs to take a levelheaded strategy to counter both the emerging challenges as well as exploit the opportunities. 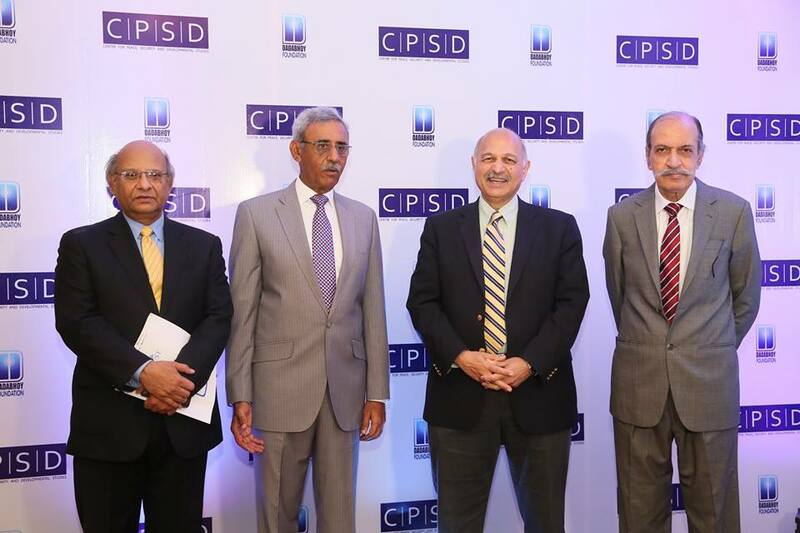 He was followed by a speech on “Geostrategic Alliances in South Asia: Pakistan’s Economic & Human Resource Opportunities and Development” by Senator Mushahid Hussain. He opined that the 21stcentury is the Asian century which is in sync with the aspirations of Pakistan’s founding fathers. We should seize the opportunity of CPEC which spans several domains in order to develop ourselves. Former Finance Minister Dr Salman Shah elaborated on the topic of “OBOR: Translating CPEC for Socio Economic Boost with safeguards for Domestic Trade and Industry”. He stressed that the favorable demographics of Pakistan would continue and awaited the moment to be translated into an engine of socioeconomic growth. There is a stark need to convert the Chinese investment in Pakistan into jobs and other human resource benefits. Dr Sania Nishtar spoke on the subject of “Pakistan: How to tap the Silver Lining”. She stressed on institutional reform particularly in the realm of governance in order to realize the benefits of the immense opportunities available to the nation. There was a dire need to revamp the public policy in order to achieve this aim. Eminent scholar Dr Ashfaque Hassan Khan used the subject of “Pakistan’s Sustainable Economic Growth: Missing Piece of the Puzzle” to stress on the need for economic reform. He maintained that the relationship with the IMF had impaired the financial sovereignty of the country. There was a stark need to reform the financial and economic setup of the country by focusing on the Human Resource development. The second session was opened by Former Federal Minster Javed Jabbar. He spoke on the topic of “Quagmire of Narratives, Mind Control and Information Age: Perception Management towards Optimism”. He first elaborated on the topic by discussing that a plurality of narratives shows a vibrant nation. We need to formulate an education system that builds a single nation but gives choices. The second speaker was PTI Senior Vice President Asad Umer who discussed “Restructuring Administrative and Governance Structure in Pakistan”. He stated that the current flaw of the system was the tyranny of the constituency politician. In order to counter the emerging problems we need to revisit our governing policies dispassionately. Comdt FWO Lt Gen Muhammad Afzal spoke on the subject of “Transforming Infrastructure for Pakistan’s Socio-Economic Development” while DG NLC Maj Gen Mushtaq Ahmad Faisal elaborated on “CPEC Logistics: Opportunities, Challenges and Way Forward”. They were followed by a twenty minutes discussion. The debate was very lively with all the participants indulging in intellectual discussion. They pondered upon questions of governance overhaul, reform of education, opportunities of CPEC, impact of OBOR and impact on Gwadar. President CPSD Lt Gen Agha Muhammad Umer Farooq (Retd) concluded the seminar with a Vote of Thanks. He summarized the entire seminar and stressed on the need to translate the given suggestions into meaningful actions.